This article is about the heavy metal band. For other uses, see Slipknot (disambiguation). Slipknot is an American heavy metal band from Des Moines, Iowa. The band was founded in September 1995 by percussionist Shawn Crahan and bassist Paul Gray. 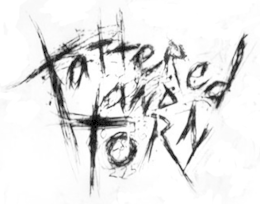 After several lineup changes in its early years, the band settled on nine members for more than a decade: Corey Taylor, Mick Thomson, Jim Root, Paul Gray, Craig Jones, Sid Wilson, Shawn Crahan, Chris Fehn and Joey Jordison. Gray died on May 24, 2010, and was replaced from 2011–14 by former guitarist Donnie Steele. Jordison left the band on December 12, 2013. Steele left during the recording sessions for .5: The Gray Chapter because he wanted to focus on his marriage. The band is now touring with replacement musicians Alessandro Venturella on bass and Jay Weinberg on drums. After the departure of Jordison, as of December 2015 the only founding member in the current lineup is percussionist Shawn Crahan; the other remaining members of Slipknot have been members since the release of the band's 1999 eponymous debut. Slipknot is well known for its attention-grabbing image, aggressive style of music, and energetic and chaotic live shows. The band rapidly rose to success following the release of their eponymous debut album in 1999. The 2001 follow-up album, Iowa, although darker in tone, made the band more popular. After a brief hiatus, Slipknot returned in 2004 with Vol. 3: (The Subliminal Verses), before going on another hiatus and returning in 2008 with its fourth album, All Hope Is Gone, which debuted at number one on the Billboard 200 chart. After another long hiatus, Slipknot released its fifth studio album, .5: The Gray Chapter, in 2014. The band has released a live album titled 9.0: Live, a compilation album titled Antennas to Hell, and four live DVDs. In 2015, Slipknot headlined the Download Festival in the UK for the third time. In the years before Slipknot formed, a state of shifting band membership existed throughout the metal scene in Des Moines, Iowa. In 1991, the biggest metal band in Des Moines was Atomic Opera, with Jim Root on guitar. Drummer Joey Jordison founded a thrash metal band called Modifidious, playing at a club called Runway. Modifidious opened for Atomic Opera on December 1, 1991, at the Runway, after which their guitarist left for the more successful Atomic Opera. Jordison replaced him with local guitarist Craig Jones. Drummer Shawn Crahan formed another Des Moines band called Heads on the Wall, playing funk metal cover songs at clubs and releasing a demo tape in July 1992. A fourth Des Moines band called Vexx played death metal with Anders Colsefni on drums, Paul Gray on bass, and Josh Brainard on guitar and vocals. Colsefni later took over vocal duties, but Vexx never recorded. During this time, Crahan often went to the Runway on Sundays when the club opened to all ages, where he met other young musicians with whom he could jam. By March 1993, Crahan was jamming with vocalist Colsefni, bassist Gray and guitarist Pat Neuwirth, writing and playing songs in Gray's basement, discussing possible band names such as Pull My Finger, but never making a final decision. One of the songs they recorded was titled "Slipknot"; another was titled "Painface", which Colsefni later used to name his band Painface. In 1993, a new band called Inveigh Catharsis formed in Des Moines, with Gray on bass, Brainard on guitar and Colsefni on drums. Jordison jammed occasionally with this group. Brainard eventually left to join Jordison and Jones in Modifidious, participating in demo recordings at the end of '93 and early in '94. During 1994 Modifidious sometimes played the same shows as Crahan's Heads on the Wall band. Gray formed a death metal band called Body Pit, soon becoming popular in the local scene. Modifidious stopped playing in the wake of death metal's increasing pull. Gray failed to get Jordison to join Body Pit, but soon after he recruited local guitar teacher Mick Thomson, the band broke up. In September 1995, Crahan and Gray started a band named the Pale Ones. The lineup was made up of friends who met through the local music scene, including vocalist Colsefni and guitarist Donnie Steele. Not long after their inception, Gray invited Jordison to a rehearsal because the band was interested in experimenting with additional drum elements. Jordison subsequently joined the band as their main drummer, moving Crahan to custom percussion. Furthermore, Colsefni also took up custom percussion while remaining the band's vocalist. The band then decided to invite Brainard as their second guitarist, bringing their lineup to six members. On December 4, the band made their live debut; playing a benefit show using the name Meld. Much of the band's early development was retrospectively attributed to late-night planning sessions between Gray, Crahan and Jordison at a Sinclair gas station where Jordison worked nights. It was there, in late 1995, that Jordison suggested changing the band name to Slipknot after their song of the same name. In December, Slipknot began recording material at SR Audio, a studio in the band's hometown. Without a recording budget, the band was forced to self-finance the project, the costs of which came to an estimated $40,000. In February 1996, guitarist Donnie Steele decided to leave Slipknot due to his Christian beliefs. When questioned in 1999 about Steele's departure, Jordison explained: "We were prepared to keep him on, but he didn't want to stay." During the mixing stages of their project at SR Audio, Craig Jones was recruited as Steele's replacement on guitar. However, throughout their time in the studio, the band were adding samples to their recordings but could not produce these sounds live. Subsequently, Jones became the band's sampler and Mick Thomson was brought in as the replacement guitarist. After a complicated time with mixing and mastering, the band self-released Mate. Feed. Kill. Repeat. on Halloween, October 31, 1996. Anticipation for Slipknot's second album was intense. In early 2001, the band began recording the second album at Sound City and Sound Image studios in Los Angeles. Around this time, conflicts arose between band members due to extensive touring and recording schedules. Recording of their second album ended in February 2001 and the band embarked on their Iowa World Tour. Entitled Iowa, Slipknot's second album was released on August 28, 2001; it peaked at number three on the Billboard album charts and at number one on the UK album chart. The album produced three singles; "The Heretic Anthem" (promotional single), "Left Behind", and "My Plague", which appeared on the soundtrack for the film Resident Evil. In 2002, Slipknot appeared in Rollerball (2002), performing the song "I Am Hated" in a scene. The release and intense promotion of the album resulted in sold-out shows in large arenas in several countries. In mid-2002, Slipknot went on hiatus because of internal conflicts. This temporary split allowed several band members to focus on various side projects. Vocalist Taylor and guitarist Root revived their band Stone Sour, drummer Jordison created Murderdolls with Wednesday 13 on vocals,percussionist Crahan founded To My Surprise and DJ Wilson went solo as DJ Starscream. For a while, the future of Slipknot was uncertain and there was much speculation about whether there would be a third album, or if the split would become permanent. Despite this, on November 22, 2002, Slipknot released their second DVD, Disasterpieces. In 2005, several members of Slipknot were involved in Roadrunner United: The All-Star Sessions, an collaborative album recorded by artists signed to Roadrunner Records for the labels 25th anniversary. 2006 saw Slipknot win their first Grammy Award, picking up the Best Metal Performance award for the single "Before I Forget". The single went on to be featured on the setlist of Guitar Hero III: Legends of Rock. On December 5, 2006, Slipknot released its third DVD Voliminal: Inside the Nine. While Slipknot was on hiatus, several band members again focused their attentions on side projects; vocalist Taylor and guitarist Root returned to Stone Sour, drummer Jordison toured with several bands and produced 3 Inches of Blood's third album Fire Up the Blades, Crahan founded Dirty Little Rabbits and Wilson returned as DJ Starscream once again. Preparation for Slipknot's fourth album began towards the end of 2007; work began at Sound Farm Studio in Jamaica, Iowa, with producer Dave Fortman in February 2008. The album was finished in June, and the band the All Hope Is Gone World Tour on July 9, 2008. Slipknot's fourth album, All Hope Is Gone, was released on August 20, 2008, debuting at number one on the Billboard albums chart. The album produced five singles; "All Hope Is Gone", "Psychosocial", "Dead Memories", "Sulfur" and "Snuff". 2009 marked the 10th anniversary of Slipknot's debut album; to commemorate the event, the band released a special edition version of Slipknot on September 9, 2009. The band toured in support of the album throughout 2008 and continued until October 31, 2009, resulting in Slipknot's third hiatus. During the hiatus, several band members focused on respective side projects; Taylor founded Junk Beer Kidnap Band and returned to Stone Sour with guitarist Root; Crahan continued working with his band Dirty Little Rabbits; and drummer Jordison returned with his band Murderdolls and became the new permanent drummer of Rob Zombie. Percussionist Fehn is now a full-time bassist with metalcore band Will Haven and Sid Wilson founded the eponymous band Sid. In 2010, Gray was planning to tour with the supergroup, Hail!, but on May 24, 2010, he was found dead in a Urbandale, Iowa hotel room. Circumstances surrounding his death at the time were not immediately known; an autopsy suspected his death was not intentional but did not reveal the cause. The day after his death, the remaining eight members of the band held a live, unmasked, press conference alongside Gray's widow and brother. On June 21, the cause of death was confirmed as an accidental overdose of morphine and synthetic morphine substitute fentanyl. The band was hesitant to comment on the future of Slipknot. The members made conflicting statements in interviews; drummer Jordison told The Pulse of Radio "there is another Slipknot record already kinda in the making". Vocalist Taylor told FMQB Productions' he was "very conflicted about whether or not [he wants] to do anything with Slipknot". The band released their fourth video album (sic)nesses on September 28, 2010; it debuted at number one on the Billboard Top Music Video Charts. The DVD features Slipknot's entire live performance at the 2009 Download Festival and a 45-minute film documenting their tour in support of All Hope Is Gone, and served as a tribute to Paul Gray. Corey Taylor performing with Slipknot in 2011. Slipknot also said the band would complete and release the band's fifth studio album, and that there were no plans to replace Gray. Jordison said the writing process for the album had already begun and that he had written 17 songs. Slipknot performed at Mayhem Festival 2012. Slipknot's first annual music festival, called Knotfest, was held on August 17, 2012, at Mid-America Motorplex near Pacific Junction, Iowa, and on August 18, 2012, in Somerset, Wisconsin. Deftones, Lamb of God, Serj Tankian also performed at the festival. The festival shows also debuted a Slipknot museum. On 14, June 2013, Slipknot headlined the Download Festival for a second time. The band performed to roughly 90,000 people and was twice forced to stop the set—once in the middle of a song—to allow the front barricade, which had split open under crowd pressure, to be repaired. In July 2014, Slipknot began releasing teasers for the new album on the band's website and social media using cryptic messages and gory imagery. "The Negative One", the band's first song in six years,was released on August 1; it was accompanied by a music video directed by Crahan that was released four days later. The video did not feature any band members. On August 24, Slipknot released an official radio single titled "The Devil In I", and the name of the upcoming album was announced as .5: The Gray Chapter on iTunes, with an expected release date of October 28. The release was later preponed to October 17 for the Netherlands and Australia, October 20 for the UK and October 21 worldwide. Slipknot began touring North America in support of the album on October 25 at the second iteration of Knotfest. The tour dubbed the "Prepare for Hell" was co-headlined by Korn with King 810 as support. The band also performed at 2015's Soundwave festival in Australia. A bassist and drummer were brought in to replace Gray and Jordison respectively; Crahan designing a mask that would differentiate them from the band. The official video for "The Devil In I", featuring musicians wearing modified versions of the band's old masks—with the exception of Taylor who wore a new mask—was released on September 12. Fans speculated upon the identities of the drummer and bassist shown in the video but the band did not officially name them. "The Negative One" was nominated for the 2014 Grammy Award for Best Metal Performance at the 57th Grammy Awards. On September 25, 2016, the band performed at their annual festival Knotfest, which was altered to include Ozzfest this year. They performed the Iowa album in it's entirety. This included the live premier of "The Shape", the second ever performance of "Skin Ticket", the first performance of "New Abortion" in 14 years and also the very first full-length performance of Iowa (the band used to do a shortened 5–7 minute version on the Vol. 3 tour). They also utilized their old red coveralls and even gave Jay and V-Man their own pairs as well. In November 2016, slipknot percussionist Shawn "Clown" Crahan revealed during an interview with Rolling Stone that he and fellow guitarist Jim Root would be teaming up in February 2017 to being writing new material for a new Slipknot album, saying “because we want to write.”. No time table was given for when the new album will be released, but speculation among fans has suggested sometime in 2018., especially since frontman Corey Taylor will be focusing on his other band Stone Sour in 2017. Slipknot's music is influenced by many styles and bands including hard rock and heavy metal bands Kiss, Anthrax, Black Sabbath, Iron Maiden, Faith No More, Helmet, Mr. Bungle, Tool, Slayer, Fear Factory, Skinny Puppy, Neurosis, Judas Priest, Metallica, Led Zeppelin and Beastie Boys. The band is regarded as a pioneer of the New Wave of American Heavy Metal; its output has been compared to that of Pantera, Machine Head, Hatebreed, Life of Agony, and Prong, among others. Slipknot is considered a nu metal band. The band's members prefer to distance themselves musically from other nu metal bands such as Korn and Limp Bizkit. Slipknot describes its sound as "metal metal" and regards the link to nu metal as coincidental and a result of nu metal's emergence being concurrent with that of Slipknot. The band's sound typically features a heavily down-tuned guitar setup, a large percussive section, samples, and turntables. Using a variety of vocal styles, the music typically features growled vocals, screaming, backing vocals, and occasional melodic singing. The band has continually experimented with its sound—most notably developing tracks led by acoustic guitars and melodic singing that first appeared on Vol. 3 (The Subliminal Verses). Slipknot's lyrics are generally very aggressive; they sometimes include profanity while exploring themes such as darkness, nihilism, anger, disaffection, love, misanthropy, and psychosis. They often draw upon topics including the music industry, politics, personal strife, and reflection, among others. Rick Anderson of Allmusic said, "those lyrics that are discernible are not generally quotable on a family website". On Vol. 3, Taylor deliberately avoided using profanity in response to claims he relied on it. The album All Hope is Gone saw a change to a standard metal style that includes elements of groove metal, death metal, and thrash metal. The band has also been considered alternative metal. Slipknot is known for its chaotic, energetic live shows that contributed to the band's success. During performances, most of the band's members headbang, stage dive, and fight. The band's early performances included extreme acts such as stage dives from high balconies and band members setting each other on fire. In recent years, they tended to refrain from acts this extreme. Former bassist Paul Gray said this was due to receiving lawsuits and to avoid harming other people, and that it was a "better move" for the longevity of the band. 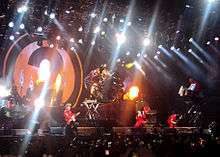 Along with the energetic and unpredictable performances, Slipknot often use elaborate stage setups that use pyrotechnics, elevated stage areas, hydraulic drum risers, and computer screens. Reviewing a Slipknot performance, Alistair Lawrence of Kerrang! said, "the choreographed chaos is too multi-faceted to fully describe". and NME described one Slipknot show as "a scene of chaos". The band's image has also been the subject of several controversies. 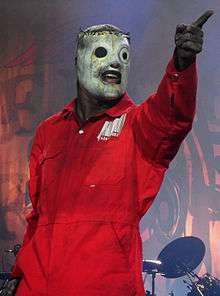 Slipknot had a longstanding feud with the band Mushroomhead which—along with their fans—said Slipknot "stole their image". While Slipknot acknowledged their images had similarities, its members were not actively involved in the feud, saying the similarities were coincidental. Taylor said, "we both started at the same time—neither one of us knowing anything about each other". Taylor also said that at a live show in Cleveland, Ohio, several Mushroomhead fans threw objects including a padlock at Slipknot and that when Slipknot's set was finished, Machine Head, and Amen went into the crowd and "handled it right there". In 2009, Mushroomhead vocalist Waylon Reavis said his band's members were no longer interested in feuding with Slipknot, saying, "they're not the first masked band, we're not, no one was". ↑ "Slipknot". AllMusic. Retrieved 2013-02-04. 1 2 3 4 5 6 7 8 9 Huey, Steve. "Slipknot biography". allmusic. Retrieved 2007-12-13. 1 2 Anderson, Rick. "Slipknot album review". allmusic. Archived from the original on 2011-10-24. Retrieved 2007-12-15. ↑ Killin, Cartiona (2002-01-25). "Rebels with a Cause". Daily Record. p. 62. ↑ "Billboard.com's page on Iowa". Billboard. Retrieved 2010-09-12. ↑ "The joy of 666". NME. UK. May 15, 2001. Retrieved 2009-04-25. ↑ "Resident Evil (2002) – Soundtracks". Internet Movie Database. Retrieved 2008-09-05. ↑ "Archive News". Blabbermouth.net. 2001-08-06. Retrieved 2010-09-11. ↑ "Slipknot Advance DVD Screening To Be Held In New York City". Blabbermouth.net. 2002-10-12. Retrieved 2008-07-05. ↑ Shawn Crahan (Director) (2006). Voliminal: Inside the Nine (DVD). Roadrunner Records. Event occurs at 2:10 in Paul Gray's interview. ↑ "Slipknot Singer Says 'A Lot Has Changed' With The Band Since 'Iowa'". Blabbermouth.net. 2003-08-05. Retrieved 2010-09-11. ↑ Wiederhorn, Jon (2004-09-03). "Slipknot Ready To Unveil New Masks, Subliminal LP". VH1. Archived from the original on 2008-04-26. Retrieved 2008-07-15. ↑ "Band Bio on Roadrunnerrecords.com". Roadrunner Records. Archived from the original on January 26, 2007. Retrieved 2007-02-11. ↑ "Billboard.com's listing of 9.0:Live". Billboard. Retrieved 2010-09-12. 1 2 "List of Grammy winners". CNN. 2006-02-09. Retrieved 2007-12-13. ↑ Peters, Mitchell (19 Jul 2008). "Chaos Theory: With a New Album Dropping and a Sweet Spot on the Mayhem Tour, Slipknot Reveals the Method to Its Madness". Retrieved 27 September 2016. ↑ "Slipknot: new DVD artwork revealed". Blabbermouth.net. 2006-10-16. Retrieved 2006-10-16. ↑ "Slipknot man promises brutal new album in '08". Kerrang!. 2007-07-20. Archived from the original on November 8, 2007. Retrieved 2007-11-29. ↑ Epstein, Dan (August 2008). "Wait and Bleed". Revolver. pp. 54–6. ↑ "Slipknot, Disturbed, Dragonforce, Mastodon: Complete 'Rockstar Energy Mayhem' Details Revealed". Blabbermouth.net. 2008-01-30. Retrieved 2010-09-11. ↑ "Billboard.com's page on All Hope Is Gone". Billboard. Retrieved 2010-09-12. ↑ "Slipknot to Release Special 10th Anniversary Debut". Roadrunner Records. 2009-07-27. Archived from the original on July 31, 2009. Retrieved 2010-09-11. ↑ "Slipknot Announces Fall Tour Dates". Blabbermouth.net. 2009-09-03. Retrieved 2009-09-03. ↑ "Slipknot Holds News Conference To Address Passing Of Bassist Paul Gray". Blabbermouth.net. 2010-05-25. Retrieved 2010-09-11. ↑ "Slipknot Bassist Paul Gray Found Dead". FMQB. 2010-05-24. Retrieved 2010-08-20. ↑ "Slipknot bassist Paul Gray dead". Metro. 2010-05-25. Retrieved 2010-09-11. ↑ "Autopsy fails to determine cause of death of Slipknot bassist". USA Today. 2010-05-25. Retrieved 2010-08-20. ↑ "Slipknot Holding Live Press Conference". slipknot1.com. 2010-05-25. Archived from the original on May 28, 2010. Retrieved 2010-08-20. ↑ Goldsmith, Belinda (2010-06-22). "Slipknot Bassist Died Of 'Accidental' Overdose". Reuters. Retrieved 2010-08-20. ↑ "Slipknot Drummer: Paul Gray 'Would Always Want Us To Make Another Record'". Blabbermouth.net. 2010-08-03. Retrieved 2010-09-11. ↑ "Corey Taylor 'Conflicted' About Continuing Slipknot". Blabbermouth.net. 2010-09-05. Retrieved 2010-09-11. ↑ "SLIPKNOT'S '(SIC)NESSES' IS OUT NOW, GET ANOTHER EXCLUSIVE LOOK AT THE DVD FROM 'KERRANG!'". Roadrunner. 2010-09-28. Archived from the original on October 12, 2010. Retrieved 2010-10-11. ↑ "SLIPKNOT's '(Sic)nesses' DVD Tops 'Music Videos' Chart - Oct. 6, 2010". Blabbermouth. 2010-10-06. Retrieved 2010-10-11. ↑ "Slipknot to release '(sic)nesses' DVD- September 28th". Roadrunner Records. 2010-08-19. Retrieved 2010-08-19. ↑ Montgomery, James (2010-09-23). "Slipknot Dedicate '(Sic)nesses' DVD To Paul Gray". Retrieved 2010-10-11. ↑ "COREY TAYLOR: If SLIPKNOT's Upcoming Tour Doesn't Work, This Band Might Be Over". 2011-05-03. Retrieved 2011-05-04. ↑ "Corey Taylor: 'Paul Gray would want Slipknot to continue' - video". NME. UK. 2010-12-06. Retrieved 2010-12-06. ↑ "Slipknot return 2011". Slipknot1.com. 2010-12-03. Archived from the original on December 6, 2010. Retrieved 2010-12-03. ↑ "Slipknot to headline graspop". slipknot1.com. 2010-12-05. Archived from the original on December 10, 2010. Retrieved 2010-12-06. ↑ "Slipknot confirmed for rock in rio". slipknot1.com. 2010-12-08. Archived from the original on December 11, 2010. Retrieved 2010-12-08. ↑ "Update regarding summer shows". slipknot1.com. 2011-03-10. Archived from the original on March 13, 2011. Retrieved 2011-03-10. ↑ "SLIPKNOT's First Show Since Death Of PAUL GRAY: HD Video Footage Available - June 20, 2011". Blabbermouth.net. 2011-06-21. Retrieved 2011-09-03. ↑ "COREY TAYLOR On Possibility Of Another SLIPKNOT Album: 'I Don't See It Happening Very Soon'". 2011-03-04. Retrieved 2011-03-05. ↑ Graff, Gary (2010-11-30). "Slipknot Prepping First Album Since Bassist's Death". Retrieved 2010-12-10. ↑ "Rockstar Mayhem Festival/Blog/2012 Dates Announced". Rockstarmayhemfest.com. Archived from the original on November 4, 2011. Retrieved 2011-10-27. 1 2 3 Boward, Chad (2012-05-29). "Slipknot Prepping Greatest Hits Release, Working on New Demos". Loudwire. Retrieved 2012-05-30. ↑ Baltin, Steve (2012-06-04). "Slipknot to launch own music festival, Knotfest". Rolling Stone. Retrieved 2012-06-04. ↑ "Slipknot close first night of Download rock festival". BBC news. 2013-06-15. Retrieved 2013-06-20. ↑ Kennelty, Greg (2013-10-21). "SLIPKNOT Frontman Says New Material Is "Really Dark," Will Be A Mix of Iowa & Vol. 3". MetalInjection . Retrieved 2013-12-07. ↑ Pasbani, Robert (2013-12-04). "SLIPKNOT So Serious About Writing New Music That Guitarist Jim Root Is Sitting Out The Next STONE SOUR Tour". MetalInjection. Retrieved 2013-12-07. 1 2 Kennelty, Greg (2014-01-02). "Joey Jordison: "I Did Not Quit SLIPKNOT"". MetalInjection. Retrieved 2014-01-09. ↑ Rutherford, Kevin (2013-12-13). "Slipknot, Drummer Joey Jordison Part Ways". Billboard. Retrieved 2013-12-14. ↑ "Slipknot drummer Joey Jordison leaves band". The Guardian. 2013-12-13. Archived from the original on 2016-04-20. Retrieved 2013-12-14. ↑ "Drummer Joey Jordison leaves Slipknot". NME. 2013-12-13. Retrieved 2013-12-14. ↑ Hartmann, Graham (2013-12-13). "Corey taylor gives first interview following joey jordison's departure from slipknot". Loudwire. Retrieved 2013-12-14. ↑ Childers, Chad. "Slipknot reveal fifth new album teaser trailer". Loudwire.com. Loudwire. Retrieved 2014-08-03. ↑ Hartmann, Graham. "Slipknot Continue to Tease New Album With Cryptic Written Message". Loudwire.com. Loudwire. Retrieved 2014-08-03. ↑ Grow, Kory. "Slipknot Stream 'The Negative One,' Their First New Song in Six Years". Rollingstone.com. RollingStone. Retrieved 2014-08-03. ↑ Grow, Kory. "See Slipknot's Nightmarish, NSFW 'Negative One' Video". Rollingstone.com. Rolling Stone. Retrieved 2014-08-07. ↑ "SLIPKNOT To Film Video For New Single 'The Devil In I'". Blabbermouth. 5 August 2014. Retrieved 2014-08-08. ↑ ".5: The Gray Chapter". iTunes. 24 August 2014. Retrieved 2014-08-24. ↑ ".5 The Gray Chapter". Amazon. 24 October 2014. Retrieved 2014-08-08. ↑ Pasbani, Robert (2014-08-11). "KNOTFEST Announce New Bands & Another Stage Added". MetalInjection. Retrieved 2014-08-29. ↑ "Slipknot unveil details of fifth studio album". The Guardian. 2014-08-25. Retrieved 2014-08-29. ↑ "Slipknot's Prepare For Hell Tour with Korn and KING 810". Roadrunner Records. 2014-08-26. Archived from the original on 2014-09-05. Retrieved 2014-08-29. ↑ Childers, Chad. "Slipknot, Faith No More, Soundgarden, Slash + Many More Lead 2015 Soundwave Festival". Loudwire.com. Loudwire. Retrieved 2014-08-21. ↑ Full Metal Jackie, Full Metal Jackie (2014-09-10). "Slipknot's Corey Taylor Talks '.5: The Gray Chapter,' 2014 Knotfest + Moving Forward". Loudwire. Retrieved 2014-09-10. ↑ "New Slipknot Bassist's Identity Revealed? - Blabbermouth.net". Blabbermouth. 2014-09-12. Retrieved 2014-09-13. ↑ Kreps, Daniel (2014-09-12). "Slipknot Host Asylum Rave in Terrifying 'The Devil In I' Video". RollingStone. Retrieved 2014-09-19. ↑ Hartmann, Graham (2014-10-08). "Slipknot's Corey Taylor on New Bassist's Identity Leak: 'I Was So Upset'". Loudwire. Retrieved 2014-10-08. ↑ Pasbani, Robert (2014-10-09). "SLIPKNOT May Never Reveal The Identity of Their Drummer". Retrieved 2014-10-11. 1 2 Doyle, Tomas (17 January 2015). "Slipknot – Hell Awaits". Kerrang!. No. 1551. pp. 16–21 (page 18). 1 2 "SLIPKNOT, ANTHRAX, MASTODON, MOTÖRHEAD Among GRAMMY AWARDS Nominees". MTV. 2014-12-05. Retrieved 2014-12-06. ↑ Slipknot Release Statement Regarding Bassist's Hospitalisation - Kerrang! ↑ Udo, Tommy (2002). Brave Nu World. Sanctuary Publishing. p. 124. ISBN 1-86074-415-X. ↑ Mudrian, Albert (2004). Choosing Death:The Improbable History of Death Metal and Grindcore. Feral House. p. 258. ISBN 1-932595-04-X. ↑ Helmet. "Helmet | Similar Artists, Influenced By, Followers". AllMusic. Retrieved 2014-04-23. ↑ "Slipknot Music Influences". MTV.com. MTV. Retrieved 2016-01-06. ↑ "'New Wave Of American Heavy Metal' Book Documents Over 600 Bands". Blabbermouth.net. Retrieved 2008-04-27. 1 2 Deeds, Michael (June 2, 2004). "6 Nu-Metal Bands You Shouldn't Be Ashamed of Liking". The Washington Post. Retrieved November 17, 2014. ↑ Blackie, Andrew (September 23, 2008). "Nu-Metal's Not Dead!". PopMatters. Retrieved November 17, 2014. 1 2 "Allmusic Review of M.F.K.R.". allmusic. Retrieved 2007-08-05. 1 2 Loftus, Johnny. "Allmusic Review of Vol. 3". allmusic. Retrieved 2007-02-15. ↑ "Corey's All Hope Is Gone track by track". Kerrang!. 2008-07-19. pp. 6–7. ↑ Thomson, Mick. "NAMM 2008 Report". On Track Magazine. Archived from the original on December 16, 2008. Retrieved 2008-07-14. ↑ Chris Steffen (2008-06-08). "New Slipknot Album: A First Listen to "All Hope Is Gone"". Rolling Stone. Archived from the original on July 1, 2008. Retrieved 2008-06-29. ↑ Loeffler, Shawn (September 30, 2010). "SLIPKNOT: "ALL HOPE IS GONE" & "PSYCHOSOCIAL"". Yell! Magazine. Retrieved July 23, 2015. Fans will also be happy to see that Slipknot has made good on their promise of putting out an album that ranks among their heaviest, and one that expands on their thrash metal guitar work and vocal melodies. ↑ Records, Roadrunner (2011-07-12). "Slipknot Announces New Album Title!". Roadrunner Records. Archived from the original on 2014-01-11. Retrieved 2013-02-11. ↑ Huey, Steve. "Slipkno". Allmusic. Retrieved 2011-03-09. 1 2 O'Keeffe, Niall (2002-02-26). "Slipknot : London Arena". NME. Retrieved 2007-12-19. 1 2 Our Last Interview with Paul Gray from Slipknot (video). andPOP. 2010-06-06. Event occurs at 1:07. Retrieved 2010-09-14. ↑ Conner, Shea (2009-01-26). "Concert review: Slipknot at the Sprint Center with Coheed & Cambria and Trivium". News-Press & Gazette Company. Archived from the original on March 3, 2009. Retrieved 2009-07-22. ↑ "Behold: the rebirth of a giant". Kerrang!. Emap. 2008-12-06. p. 16. ↑ "Slipknot bring fire and destruction to Download". NME. 2009-06-14. Retrieved 2009-06-16. ↑ Soghomonian, Talia (2002). "Interview with Corey Taylor of Slipknot". NYRock. Retrieved 2007-12-21. ↑ "News Archive". Blabbermouth.net. 2001-05-20. Retrieved 2007-12-16. ↑ Wiederhorn, Jon (2004-03-09). "Slipknot Ready To Unveil New Masks, Subliminal". MTV. Retrieved 2007-12-16. ↑ Slipknot. Vermilion Music Video. Roadrunner Records. Archived January 4, 2012, at the Wayback Machine. ↑ Kerrang! Podcast: Slipknot exclusive!. Kerrang! (video). 2008-07-01. ↑ "Slipknot's Chris Fehn: 'It's A Blessing That We Don't Get Recognized'". Blabbermouth.net. 2005-05-25. Retrieved 2010-09-11. ↑ "Slipknot's 'Tattered And Torn' Clothing Line; First T-Shirt Designs Unveiled". Blabbermouth.net. 2008-07-27. Retrieved 2008-07-28. ↑ O'Toole, Megan (2003-07-10). "Young Killers Try To Blame Slipknot For Murder". Chart Communications. Archived from the original on June 29, 2009. Retrieved 2009-09-16. ↑ Mindslavor (2006-08-17). "Slipknot Lyrics Found At Site Of Grave Robbery". Metalunderground.com. Retrieved 2007-12-23. ↑ Tsigonis, Victoria (2008-08-22). "Slipknot Singer Speaks Out About Stabbing In South Africa". Gigwise. Retrieved 2010-09-11. ↑ "Mushroomhead Drummer: Slipknot 'Traded A Platinum Record For Dignity, Honor And Respect". Blabbermouth.net. 2006-10-09. Retrieved 2010-09-11. ↑ "Slipknot Frontman Discusses Mushroomhead 'Feud'". Blabbermouth.net. 2005-03-11. Retrieved 2010-09-11. ↑ "Mushroomhead Vocalist Says There is No More Beef With Slipknot". Blabbermouth.net. September 14, 2009. Retrieved 2009-12-28. 1 2 "The Smoking Gun's Page about the lawsuit". The Smoking Gun. Retrieved 2007-03-17. ↑ "Gold and Platinum database". Recording Industry Association of America. Retrieved 2007-12-15. ↑ D'Angelo, Joe (2001-02-16). "Slipknot Working On Album As They Ponder Grammys, Touring". MTV. Retrieved 2007-12-16. ↑ "Slipknot's Paul Gray: "I Know System Of A Down Will Win Grammy"". Blabbermouth.net. 2002-02-27. Retrieved 2007-12-16. ↑ "Grammy Awards Nominees Announced!". Blabbermouth.net. 2003-01-07. Retrieved 2007-12-16. 1 2 "Metallica, Cradle Of Filth, Motorhead Among Grammy Nominees". Blabbermouth.net. 2004-12-07. Retrieved 2007-12-16. ↑ "Metallica, Judas Priest, Mötley Crüe, Slipknot, Disturbed Among Grammy Nominees". Blabbermouth.net. 2008-12-03. Retrieved 2008-12-04. 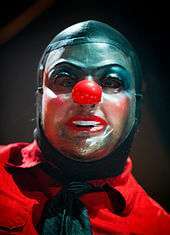 Wikimedia Commons has media related to Slipknot (band).